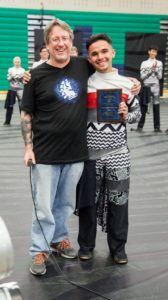 DENVER, CO – On Sunday, April 15th, the 2018 Blue Knights Percussion Ensemble hosted their Send-Off Show at Standley Lake High School. After a full day of rehearsal, the members and staff recognized outstanding members before the percussion ensemble did one last public performance for a standing room only crowd. Mike Nevin, BKPE Ensemble Director, welcomed everyone and thanked the admin team, parents, volunteers, and staff who have made this 25th Anniversary season possible. He also thanked the Blue Knights members for their dedication to bring DISTORTED to life. ∴ Follow the Blue Knights as they travel to Dayton for the Winter Guard International Championships on social media: Facebook (BKPE), Twitter (BKPercEnsemble) and Instagram (BlueKnightsPercussionEnsemble).